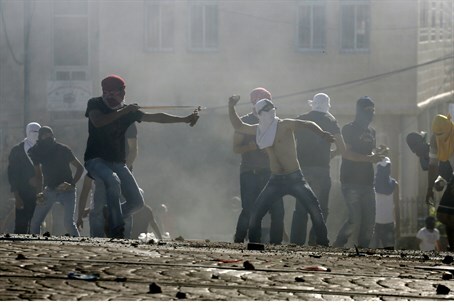 Jerusalem police spokesman says Muslim Ramadan holiday began wave of riots, arrests; 130 policemen injured since June. Over 130 police officers have been injured in Arab rioting in Jerusalem, according to police spokesman Asi Aharoni - who marked Ramadan as the "turning point" for the Holy City which saw a bloody descent into chaos in Arab neighborhoods two months ago. "Ramadan this year was particularly tense," Aharoni stated, in an interview with Channel 2 News. "[Tensions] culminated on the night of Al-Qadr" -- a reference to a Muslim holiday focused on atonement, prayer and celebration that took place on July 26 this year. On that day, he said, "there were 42 simultaneous reports of separate incidents, which saw the participation of dozens, even hundreds of people." Four thousand (4,000) police officials were on patrol that night, he said, on high alert after rioting had begun to rise steadily since Ramadan began. By now, he said, "we have 600 arrests, 240 indictments filed, and it doesn't end there." Weapons against police have gotten deadlier, he added. While firework-launching has long been a common occurrence during the frequent Arab riots in Jerusalem, the rioters have begun firing large amounts of them at police at once, requiring police to respond with riot dispersal measures more frequently. The phenomenon has led to the high number of police injuries, he said; of the 130 recorded injuries among police forces, at least thirty (30) were said to be from fireworks alone. Violence is spreading, he said, noting that the epicenter of Arab violence in Beit Hanina and Shuafat is now just the tip of the riot zone. Several of these areas were relatively peaceful beforehand, as well. "Beit Hanina used to be the Abu Ghosh of Jerusalem, but in light of these events many Jewish residents are afraid to return there," he said. Abu Ghosh, an Arab village outside of Jerusalem, is known for its relatively friendly population, and holds many Jewish wedding halls - even religious ones. Aharoni also noted the extensive damage from last month's firebombing of the Jerusalem light rail stations in Beit Hanina, which amounts to millions of dollars. Fifty indictments were filed for the firebombing incident alone, he noted. Rioting in Jerusalem spiralled after the death of 16 year-old Arab teen Mohammed Abu Khdeir, whose body was found in the Jerusalem Forest in June in a "revenge killing" for the savage abduction and murder of three Israeli teenagers. According to the most recent Israel Security Agency (ISA or Shin Bet) report on Jerusalem, terror has risen dramatically in the city since then - from 22 incidents in May and June to 152 in July and August, a whopping 509% increase.